Since 2006, Curry Without Worry has been feeding about 250 hungry souls every single Tuesday in San Francisco's Civic Center--rain or shine. Strengthen our fight against hunger by helping us DOUBLE the number of people we can serve this year by donating at least $75 (this feeds 42 people!) --or whatever you can spare. It costs about $1.75 to feed one person a free, generous helping of Nepalese vegetable curry, healing 9-bean soup, steamed brown rice, spicy tomato chutney and handmade bread so every bit will help us get closer to our goal of $50K to serve 2X the number of people in need of a warm meal on Tuesdays. 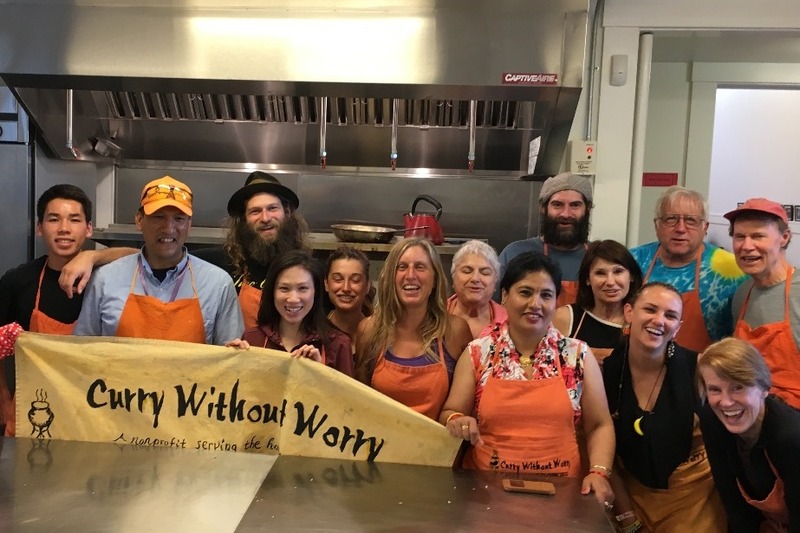 We are a family of volunteers and staff from all walks of life and all over the world, working together to help our community in the simplest way we can--offering a hot, healthy and delicious meal. We bring freshly-made vegan food to the lines of people waiting for what may be their only meal of the day. In serving, we are given the gift that only sharing with fellow humans can provide, and the people who come enjoy our food are given our love through the healing food we prepare. Please help Curry Without Worry be a bridge to healing food, nourishment and a loving community to more of our fellow men, women and children in need in San Francisco. If you ever find yourself in the SF Civic Center on a Tuesday evening, please stop by to try our delicious food and meet our dedicated team of volunteers. We welcome everyone! We are a 501(c)(3) and your donations are tax deductible. Our Federal Tax ID is 45-0552584.